According to The Teachers Calendar, February is American Heart Month as decreed by Presidential Proclamation each year since 1964. As I reported in last week’s Weekend Cooking post (Book Review: Eating Well for a Healthy Heart Cookbook), I looked at my library for heart healthy books to review for Weekend Cooking in February and found so many that I started in January. Summary: There are only a few pages of nutritional advice at the beginning of this book, not even an explanation of the diabetic exchanges although they are prominently displayed in the nutritional information about each recipe. The recipes are attractively laid out on lots of white space, mostly one recipe per page with complete nutrition information in a sidebar. Lots of recipes have an italicized “cook’s tip” to help with preparation. There is a center section of color photographs but no photographs or illustrations with the recipes. Thoughts: The salad recipes sounded particularly good in this book, especially because several seemed appropriate for winter, like “Spinach and Orange Salad with Pumpkin Seeds” or “Spicy Marinated Broccoli Salad.” Since I had excess cabbage from last week’s recipe (Crispy Fish Sandwich with Pineapple Slaw), I decided to make one of the slaw salads in this book: Fresh Citrus and Ginger Slaw. This is a cookbook meant for meals for two, but I ended up doubling this dish for us. It was going to be our only vegetable side for supper and I wanted more than a single batch would provide. Otherwise, I followed the recipe pretty closely except I used extra virgin olive oil in the dressing instead of canola because I like the stronger flavor and healthier profile of olive oil. The recipe called for packaged coleslaw mix, but, as I did last week, I sliced carrots and cabbage to make my own. We find raw onion too harsh in salads, so I left out finely chopped red onion. We really liked this. The dressing is just the right blend of sweet, citrusy, and spicy and it worked well with the cabbage. There was a lot of dressing left in the bottom of the bowl, so maybe I could have kept the original recipe for the dressing and just added more veggies. The excess dressing did give the salad a kind of marinated quality if allowed to sit for half an hour or more. 1. In a medium bowl, whisk together the orange zest, orange juice, lemon juice, sugar, oil, and gingerroot. 2. Add the cabbage and carrots. Toss thoroughly and let stand for at least five minutes. 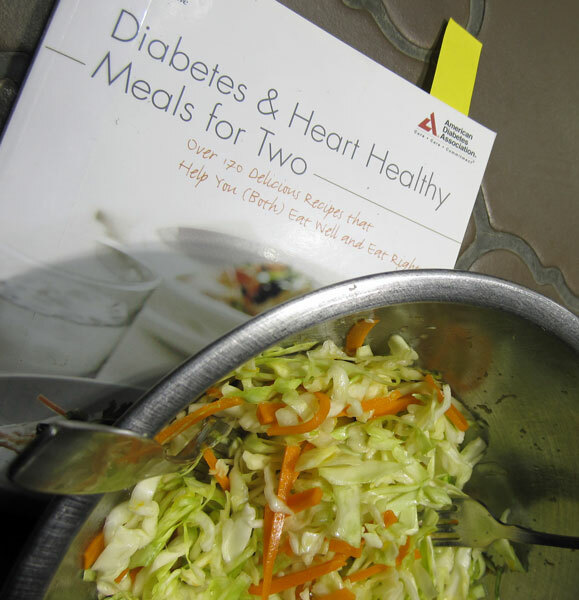 Appeal: Diabetes & Heart Healthy Meals for Two will be especially helpful to those of us cooking for two, even if I did double the vegetable recipe. It’s the entrée recipes where that feature really shines. I love that this cookbook has a full section of vegetarian entrées along with the more conventional fish, poultry, and meat ones. There’s also a lovely dessert section – tiramisu, anyone? Challenges: This is my second book for the Foodie’s Reading Challenge for 2011. And, this is my post for the weekly Weekend Cooking meme, click through to see other bloggers’ cooking adventures. that sounds like a nice light, refreshing slaw. But I am adding the onion! I actually have everything on hand to try this recipe out. I love a good coleslaw but this one with oranges sound special. I like the way you analyzed the book and the recipe. This sounds really good and refreshing. Too bad there wasn’t more nutritional advice, but still the recipe looks great. This sounds really lovely – I’d gobble it up in a heartbeat. My question, though: my partner doesn’t care for ginger at all (much to my dismay.) Do you think the recipe would be as nice without it? I’d love to try it out sometime! Margot: hope you like it! Kate: I think it would work without the ginger. It would be fruity and sweet which is a nice change for a cabbage salad. Chinoiseries: cabbage holds up to a lot of abuse! I really like cabbage salads in the winter because lettuce can get expensive and sometimes sour. Cabbage stays steady at .99 a pound at our supermarket and the flavor is always the same. Citrus in the salad sounds so refreshing. I have the cabbage and plan to try this later in the week. Thanks.